A long-awaited new edition of the seminal text on the spiritual system that is a convergence of Gnosticism and Haitian voodoo, The Voudon Gnostic Workbook is a singular sacred work that is comprehensive in scope--from "how to be a lucky Hoodoo" to how magick and voodoo intersect energetically, to esoteric time travel. 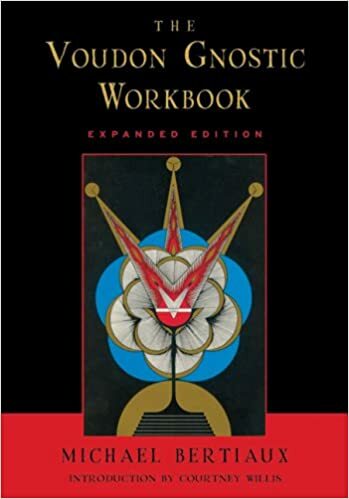 Complete with charts and graphs and instructive interdimensional physics, The Voudon Gnostic Workbook is an "object of desire" among students of the occult. Weiser's long-anticipated republication of this rare text will be an event in the annals of esoteric publishing, as the book itself is somewhat of an "unholy grail." There are listservers devoted to it and much discussion of the mysteries held within its pages. While The Voudon Gnostic Workbook has remained a controversial book considered important for masters of metaphysics, it recently came into popular culture and renewed popularity when Grant Morrison revealed it had been the inspiration for his cult comics The Invisibles, using the cribbed time travel from Bertiaux' s masterwork. Voodoo is not an evil religion and is much misunderstood. It derives from the Dahomean Gods called the "Loa." Esoteric voodoo is actually a highly practical procedure for leading us into making contact with the deepest levels of our being and most ancient modes of consciousness. Michael Bertiaux's Voudon Gnostic Workbook is the most comprehensive and illuminating contemporary book on the subject. Launched out of a correspondence course and series of classes for students and followers of Voudon Gnosticism and the OTO, this seminal text is at once one of the most mysterious and magnificent of all esoteric books. "Voundoun, popularly referred to as "Voodoo," has held a great mystique for Westerners for centuries--inspiring tantalizing legends of "voodoo dolls," "zombies," and ecstatic possession during wild orgiastic rituals of drumming and dancing. Bizarre depictions of "Voodoo" have featured in many Hollywood movies since Voodoo Woman, a 1957 horror film now considered to be one of the 50 worst films ever made. The ghost of Marie LaVeau, the famous "Voodoo Queen of New Orleans," still haunts the graveyards and bayous of urban myth. But behind the myths and legends have always lurked the deeper Mysteries of an ancient tradition of magic and spirituality rooted in the blood-drenched soil of Western Africa, from which generations of tribal peoples were captured and transported into lives of slavery in the plantations of America and the Caribbean. The fear in which "Voodoo" has been held for centuries attests to its power. This long-awaited grimoire of authentic Voundoun will be a treasured gem in any occult library!" seeking any type of initiation physics, so that the initial experience of the Time-Station in action will be allowed. The candidate must be accepted by the logic of the system. The candidate must cause the system to notice his energy field. When this happens, of course, the system can operate. However, the system can only operate with a like-type of energy field. The observer might add that this appears to resemble the process in physics where one energy field causes the reactions of another.